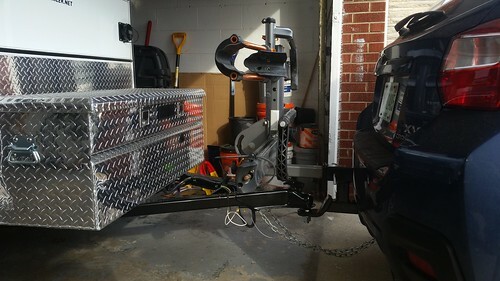 My other solution is to add a receiver to the back of the trailer on a swing arm so it can be moved away without removing it. I think that dual hitch extender is a neat idea. I wonder if it would work with my class 1 hitch? I saw one online at Harbor Freight. Until gas went to $4.00 a gallon I used to have a 15 passenger Ford van for them. We also ride tandems a lot... so the extra length was good for that. We also carried a 21 ft tandem kayak with it. Like Fenlason, I carry my bike inside my tow vehicle whenever possible. It stay clean and hidden away. I don't have a real big TV, it's a Ford Edge. I usually take the wheels off and I have a fork mount with a homemade extension that holds the rear up off the floor. It works well and I think I will build a wheel holder as well to keep them from being tossed around. Don't fear the wheel-less bike reassembly! Once you learn the tricks to put them back on you'll probably like the idea. I even turn the handlebars 90 degrees when I am rally packing tight in the Edge. We are actually back to a "big" van again. A year and a half ago we purchased a Ram Promaster. 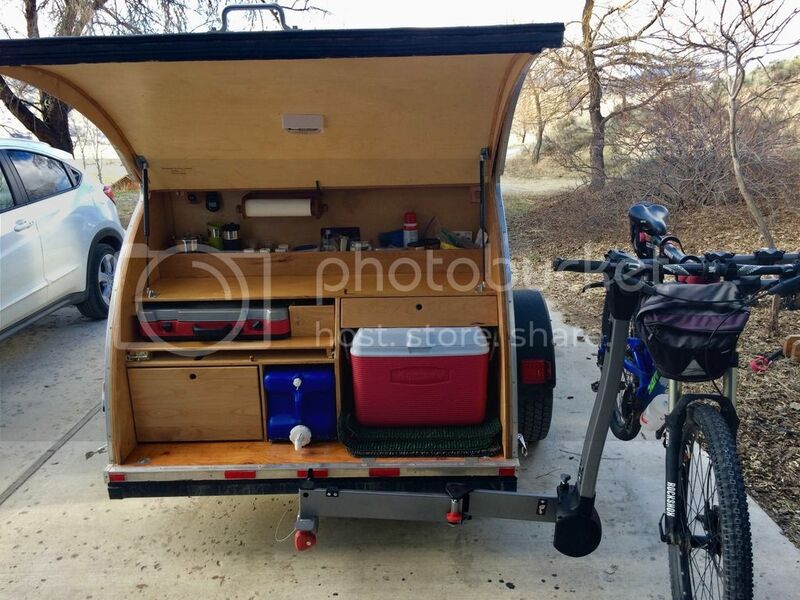 It's my combo bike hauler / lumber carrier / daily driver. The engine is a smaller turbo diesel so it gets better milage than my wife's Honda minivan. I have some cabinets in the back. and I then mounted old Thule bars. and put Rockymount roof top bike carriers on those. I can carry 4 bikes on that, and still have room for a bit of lumber or other building materials underneath this. It is also tall enough I can stand up to change inside. 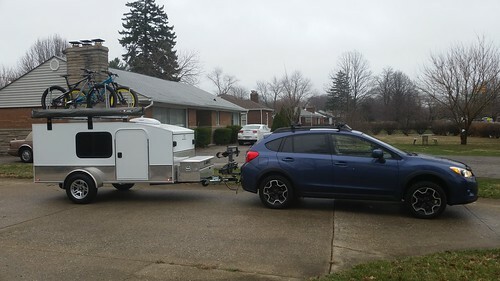 The trailer did come with a Thule hitch mounted on the back of the trailer itself but I didn't like the idea of not being able to see the bikes and if by chance one were to come loose and bounce off as I was traveling down the highway I wouldn 't be aware of it until much later. I know this is an OLD post, however, did the extender and double mount work well? 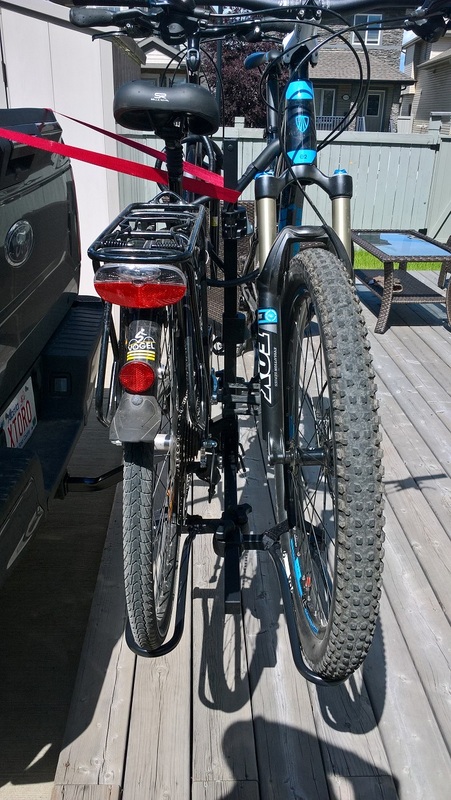 Hitch extenders typically cut your max tongue weight in half, so on a class 1 hitch your bikes may be all you can put on it, no trailer. 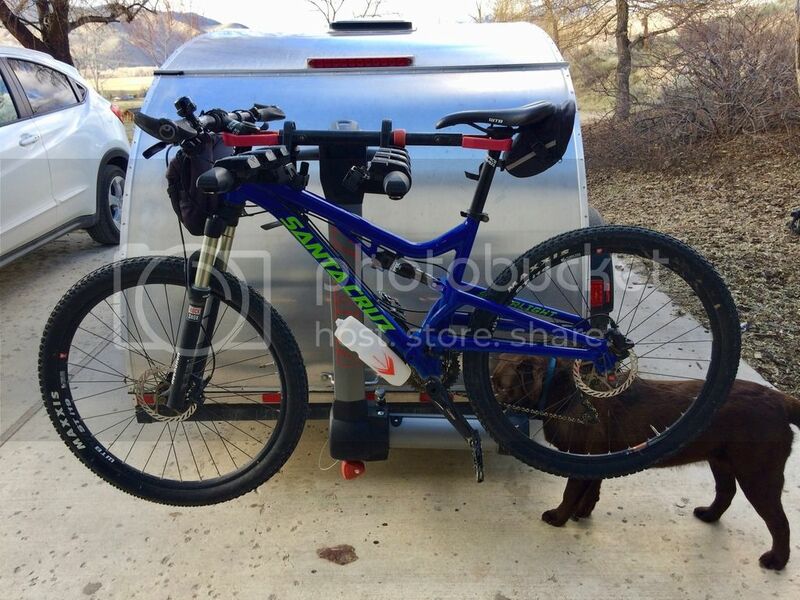 We just bought a Yakima Swingdaddy. I've got great hopes for it. I thought about a roof rack on my truck but that would be a big hassle loading/unloading and I'll pass on the extra drag. 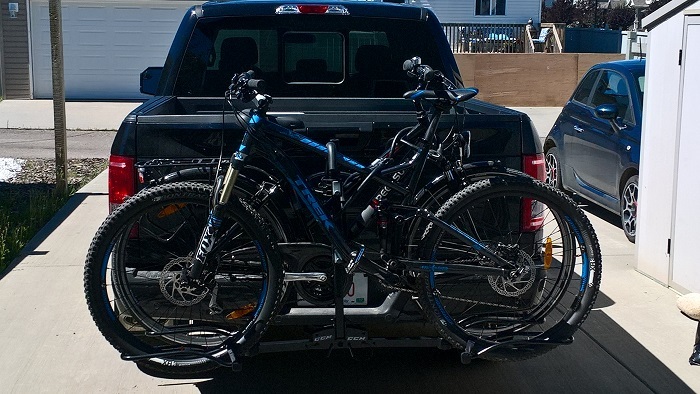 If I am pulling the tear and have bikes, I use a hatch mount bike carrier. It can bring two, and I have a roof rack that I can get two more on without real trouble. Wont putting a bike carrier what? Sorry, i dont understand the question. Class 1 hitch handles 200 pounds tongue weight. Cut that in half with an extender is 100 pounds. Thats a bike rack and 2 bikes or so. If you have a 1000 pound trailer with 100 pound tongue weight you can add 100 pounds of stuff to the tongue. However if you add a hitch extender your rating becomes 100 pounds which is what your trailer itself is and you cant add anything. This is the setup I had last month. Drove from Indianapolis, IN to Sedona, AZ and back for a RT of about 3300mi. My hitch rack is a Kuat NV.  Some challenges I have to deal with. Rear galley access on my Hiker Trailer is a side-swing door. The Kuat doesn't fold down enough to permit access. 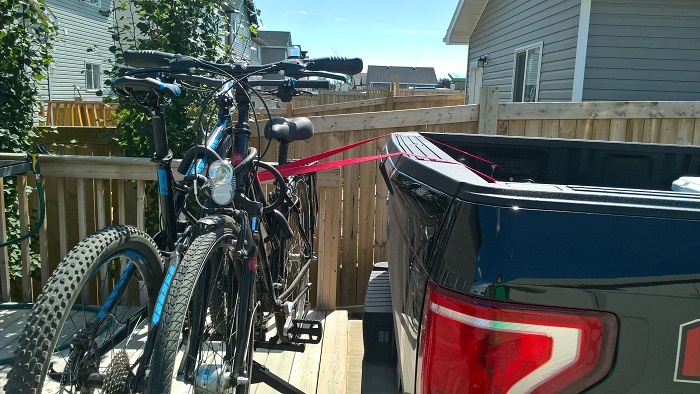 For that matter, Kuat is emphatic about NOT using its racks on either extensions or the backs of trailers, so I won't be going there with it, though some manufacturers are okay with it (1upUSA hitch racks, for example, if you limit to 2 bikes). The bikes in question weigh probably 60lb in total. On this trip, I knew I would need to be driving between camp and the Sedona mtb festival grounds every day - roughly a 20min drive. I had already attached the roof trays onto the trailer and didn't feel like moving them to the car. However that may wind up being the long term solution to that problem. 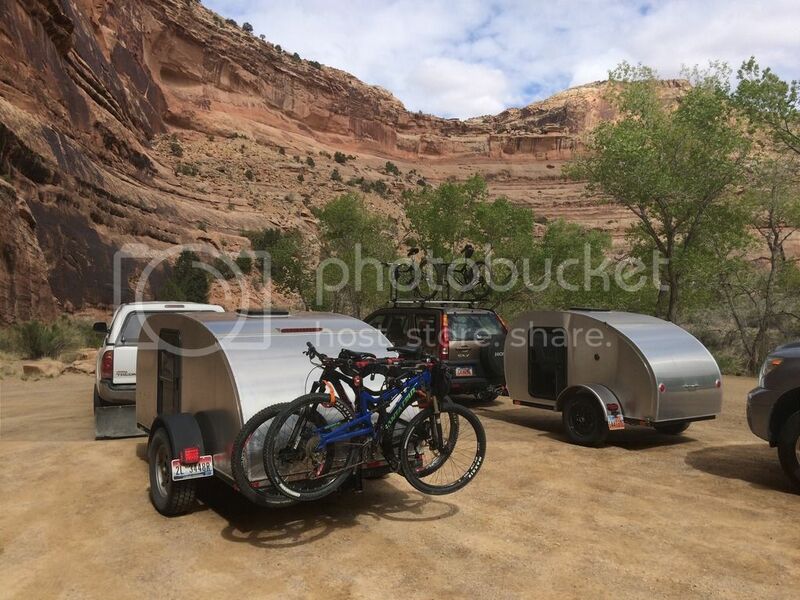 For short trips where we can ride out of camp, bikes on the trailer are no problem. Here's a close up of the connection so you see some limitations of the setup I actually used. I won't be doing it this way in the future because there's just not enough room. I had to be careful about turning radius, because the rack would contact the tongue box. Also you can see that the underside of the rack was VERY close to the coupler on the trailer tongue. There was no contact on the trip, however to attach/detach the trailer, I had to remove the rack. That was a PITA. I also had to remove the tongue jack that came with the trailer and install a new one that I could fold out of the way. 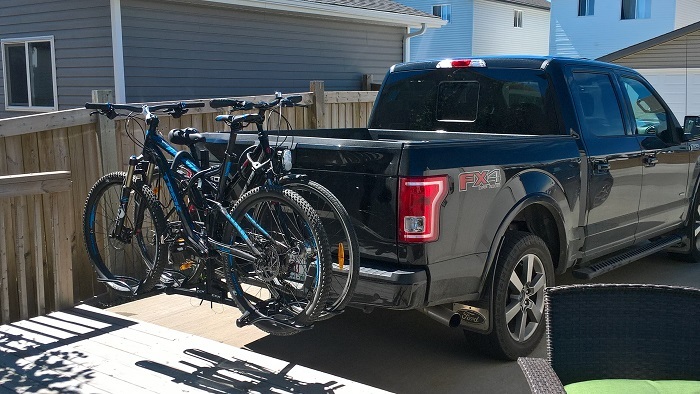 My long term goal, I think, is to buy a small pickup so I can load the bikes in the bed. 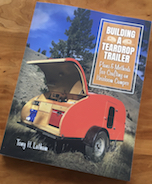 This will be especially useful when I need to transport them to trailheads distant form camp. Also it will be nice for getting the bikes out of the wind when on long drives. Fuel economy on the subie for this trip dropped from around 28mpg to 18mpg. Considering the size of the fuel tank, it meant for more frequent fuel stops, and more transit time. I think even a 4cyl pickup would allow for much improved fuel economy when towing. Partly due to improving aerodynamics of the package, but also due to improved ability of the truck to tow the TD. Short term, I think I'll manage mostly with what I have. Heading out this weekend with the camper and the bikes. 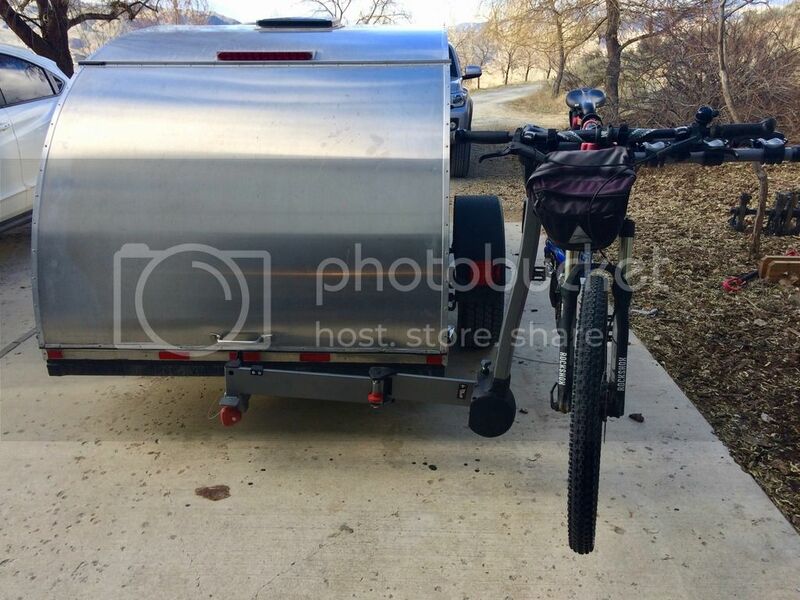 May not be able to ride because of Saturday rain, but my campsite will be right by the trailhead if I do, so no need to worry about bringing the hitch rack.